Oh, yeah. That pun was just for DCsis. And also, because it was just begging to be said. 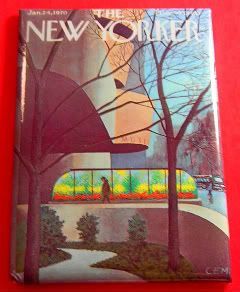 Today in 1959, Frank Lloyd Wright's Guggenheim opened for business! To celebrate, admission is free! All day! Woot! It's a work day! Boo! Happy birthday, anyway, Guggenheim New York! Actually, reading that article I linked to above, I totally have to go at some point, because they're unveiling Memory, a new work from Anish Kapoor - he's the guy that did the reflecty eggy in Chicago's Millennium Park, and the reflecty disc-y thing in Rockefeller Center a few years ago. HEE! Love puns. Anish Kapoor also has "S-Curve" at the Sackler/Freer galleries in D.C. Supercool.